Did the new Nike+ Fuel band tracker really move us? Nike has jumped into the fitness tech fray with the FuelBand, which tracks your day-to-day activity and measures this through a new medium called NikeFuel. The more active you are, the more NikeFuel you will be rewarded with per day. Nike FuelBand users can decide at the beginning of the day what level of NikeFuel they want to reach that day. 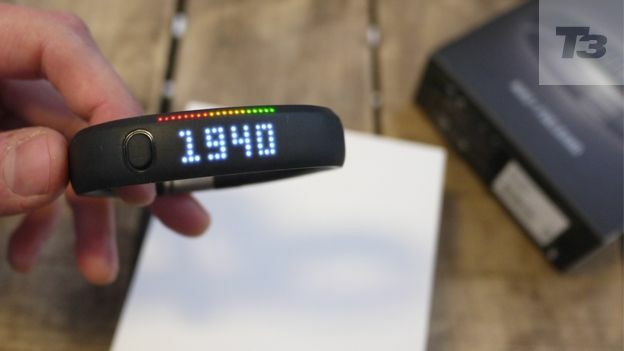 The Fuelband then displays how close you are to achieving your goal via a series of 20 LEDs that gradually go from red to green as you approach your target. Specifically, the Nike FuelBand uses accelerometry to record data about your exercise, which it can then relay to you as time, steps, NikeFuel or calories. So how does Nike's latest fitness gadget fare? T3 put the Nike Fuelband to the test over two months to see if it really could get us moving and motivated. As fitness and tracking devices go, this Nike Fuelband is a looker. It has all the simplicty of a Lance Armstrong LiveStrong charity wristband, it's just slightly more weighty without being annoyingly bulky. During the course of the test we had ours on playing tennis, making cocktails, at work and even in the shower and found it relatively easy to forget you're wearing it. That solves one of the main problems with similiar bulkier devices like a BodyMedia Fit which is worn on your upper arm and can become a little intrusive. The rounded edges and smooth rubber coating mean it's comfortable and actually looks more like a cool fashion accessory than a fitness or health tracking device. The band is controlled via a single button on front of the Fuelband. A single tap brings up a very retro LED display showing your latest Fuel points total along with a band of red-amber-green that gives you a simple visual guide to how you're tracking against that day's target. The display also has an ambient light sensor so the brightness automatically adjusts. We did find it a little annoying that display can't be made to stay on for longer or the time left permanently on. For those who want to track how active they are in the shower, or just for playing sport in the rain, the Fuelband is water resistant. We actually tested it in the shower and it held up fine. Sadly it's not fully waterproof, so swimming is out. The bottom of the bracelet features a stainless steel clasp, one side of which has the USB connect that you use to charge and, if you're not doing so over WiFi, to sync your latest stats with the iOS app and your Nikeplus.com profile. The USB connector actually feels fairly robust unlike the Nike+ Sportswatch where you get the feeling it might be prone to snapping if used to heavily. However, having charged this with variety of laptops we found that the bracelet often encroached on the keyboard due to the position of the USB slots, making the keys depress. Next to the clasp there's the ability to add in or remove bracelet extenders, meaning tht the Nike+ Fuelband can be sized for comfort, particularly useful if you ever want to pass this onto another user. The Nike+ Fuelband uses a 3-axis accelerometer to measure your motion, then based on your height and weight it provides an estimate of your calories burned, steps taken and overall distance covered. What it won't do is give you an accurate GPS-based reading on how far you've run like other run-tracking devices. This is very much a gadget that aims to help people become generally more active rather than targetting specific sports. Essentially any activity where you're not using your arms won't really register your energy expelled accurately. So cycling, weight lifting or doing squats with stable arms won't earn you as much NikeFuel as shaking up a cocktail. As a general measure of how much you're on the move each day though, this is a pretty inspirational piece of kit. Highly likely to have you walking that extra bus stop or taking the stairs over the lift. The Nike+ Fuelband works in conjunction with a simple app for Apple iPhone and Apple iPod Touch. The app essentially has three screens, Home shows your key stats for the day. You get your NikeFuel total, using the red-amber-green display for at-a-glance access to your performance against the daily target. It also gives calories, steps and distance. The second screen provides a graphical representation of your activity for a period of time, day, week, month, year so you can see when you've been at your most active. The final view presents information on your records such as best day, best week, your total NikeFuel earned and also any special awards you've picked up along the way. Syncing with the Nike+ Fuelband app is extremely simple. Once you've paired the Fuelband with your app via Bluetooth, you simply press and hold the button on the band while the app is open and the app updates in seconds. The band has two lithium polymer batteriesand Nike claims this is enough to keep it charged for up to four days. The Fueldband is very much in the Fitbit Ultra and Jawbone UP market more than the Nike+ Sportwatch or the Adidas MiCoach end of tracking. It's a really good looking accessory that has out-of-the-box instant accessibility and some really addictive features that should get you moving.